Sarah Bear Elizabeth Wishnevsky (born September 22, 1971) is an American author who works primarily in speculative fiction genres, writing under the name Elizabeth Bear. 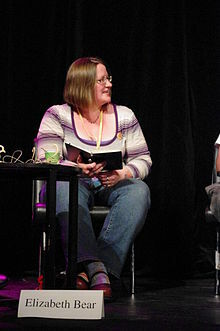 She won the 2005 John W. Campbell Award for Best New Writer, the 2008 Hugo Award for Best Short Story for "Tideline", and the 2009 Hugo Award for Best Novelette for "Shoggoths in Bloom". 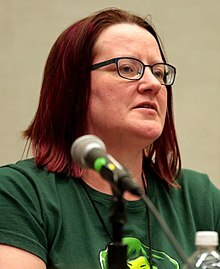 She is one of only five writers who have gone on to win multiple Hugo Awards for fiction after winning the John W. Campbell Award for Best New Writer (the others being C. J. Cherryh, Orson Scott Card, Spider Robinson, and Ted Chiang). Bear's first novel Hammered was published in January 2005 and was followed by Scardown in July and Worldwired in November of the same year. The trilogy features Canadian Master Warrant Officer Jenny Casey, who is also the main character in the short story "Gone to Flowers". Hammered won the Locus Award for Best First Novel in 2006. The Chains That You Refuse, a collection of her short fiction, was published May 2006 by Night Shade Books. Blood and Iron, the first book in the fantasy series entitled "The Promethean Age", debuted June 27, 2006. She is also a coauthor of the ongoing Shadow Unit website/pseudo-TV series. In 2008, she donated her archive to the department of Rare Books and Special Collections at Northern Illinois University. She is an instructor at the Viable Paradise writer's workshop and has taught at Clarion West Writers Workshop. The opening quote in Criminal Minds episode "Lauren" (6.18) was a direct quote of the second and third lines of Bear's book Seven for a Secret: "The secret to lying is to believe with all your heart. That goes for lying to yourself even more than lying to another." She is one of the regular panelists on podcast SF Squeecast, which won the 2012 and 2013 Hugo Awards for "Best Fancast". Bear married novelist Scott Lynch in October 2016. "Okay, Glory" in Twelve Tomorrows (2018, MIT Press). "The Heart's Filthy Lesson" in Old Venus (2015, Bantam Books). "This Chance Planet" at Tor.com, October, 2014. "King Pole, Gallows Pole, Bottle Tree" in Naked City: New Tales of Urban Fantasy (2010, St. Martin's Press). "The Horrid Glory of Its Wings" at Tor.com, December 2009. "Swell" in Eclipse Three (2009, Night Shade Books). "The Red in the Sky is Our Blood" in METAtropolis (2009, Subterranean Press). "Snow Dragons" in Subterranean Magazine, Summer, 2009. "Two Dreams on a Train" reprinted in Rewired: The Post-Cyberpunk Anthology, 2009. "Inelastic Collisions" in Inferno (2009, Tor Books). "The Girl Who Sang Rose Madder" at Tor.com, September 2008. "Boojum" (with Sarah Monette) in Fast Ships, Black Sails (2008, Night Shade Books). "Shoggoths in Bloom" in Asimov's Science Fiction, March 2008. "Sonny Liston Takes the Fall" in The Del Rey Book of Science Fiction and Fantasy (2008, Del Rey). "Your Collar" in Subterranean Magazine, 2008. "Annie Webber" in Nature, 2008. "Hobnoblin Blues" in Realms of Fantasy, February 2008. "The Ladies" in Coyote Wild, December 2007. "Black is the Color" in Subterranean Magazine, Summer 2007. "Matte" in Fictitious Force, 2007. "The Rest of Your Life in a Day" in Jim Baen's Universe, October 2007. "Cryptic Coloration" in Jim Baen's Universe, June 2007. "Tideline" in Asimov's Science Fiction, June 2007. "Abjure the Realm" in Coyote Wild, Winter 2007. "War Stories" in Jim Baen's Universe, February 2007. "Orm the Beautiful" in Clarkesworld Magazine, January 2007. "Love Among The Talus" in Strange Horizons, December 11, 2006. "Lucifugous" in Subterranean Magazine #5 (2006, Subterranean Press). "Sounding" in Strange Horizons, September 18, 2006. "Two Dreams on Trains" reprinted in Year's Best Science Fiction #23 (July 2006). "Li Bai Drowns While Embracing The Moon" in Not One Of Us, Issue 42. "Seven Steeds" in Lone Star Stories, Issue 29, Oct 2008. "e.e. 'doc' cummings" in The Magazine of Fantasy & Science Fiction, March 2003. Annalee Newitz of io9 wrote that Bear "is famous for combining high-octane military/spy tales with eccentric and subversive subplots". 2008 Theodore Sturgeon Memorial Award for Best Short Science Fiction for "Tideline"
2008 Hugo Award for Best Short Story for "Tideline"
2009 Hugo Award for Best Novelette for "Shoggoths in Bloom"
2012 Audie Award for Best Original Work for "Metatropolis: Cascadia"
^ "2009 Hugo Awards". www.locusmag.com. 2009-08-09. Archived from the original on 2009-03-26. ^ "Elizabeth Bear Papers, 2005- 2011". Northern Illinois University. 2008-04-18. ^ "Elizabeth Bear - Award Bibliography". www.isfdb.org. ^ "Scott Lynch and Elizabeth Bear got married!". Gentlemen Bastards. October 10, 2016. Retrieved May 15, 2018. ^ "Elizabeth Bear One Eyed Jack cover art and synopsis reveal". Upcoming4.me. May 2, 2013. Archived from the original on May 5, 2013. Retrieved May 2, 2013. ^ "Elizabeth Bear - Steles of the Sky cover art and synopsis reveal". Upcoming4.me. July 8, 2013. Archived from the original on January 12, 2014. Retrieved July 10, 2013. ^ Martin, George R. R. (June 19, 2014). "Not A Blog: Venus In March". GRRM.livejournal.com. Archived from the original on August 21, 2014. Retrieved September 27, 2014. ^ a b c d e f "Elizabeth Bear". The Locus Index to SF Awards. Locus Magazine. Archived from the original on 2015-08-29. Retrieved 2013-10-02. ^ "The Audie Competition 2012 Winners and Finalists". Audiofile Magazine. Retrieved 2013-10-02. ^ "Announcing the 2012 Hugo Award Winners". Tor.com. 2012-09-02. Retrieved 2013-10-02. Wikimedia Commons has media related to Elizabeth Bear.